If there is only one thing you do in Belize, make sure it’s to visit the Actun Tunichil Muknal (ATM) caves. We did the cave tour with Maya Walk ($95USD) and have only the best reviews about the tour company. The guides were knowledgeable and the provided lunch was top notch. We left San Ignacio early in the morning (before 8am) as to ensure that we were one of the first groups to arrive at the caves. 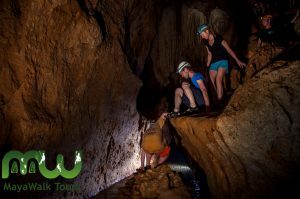 Since there are multiple tour companies that provide excursions into the cave, it’s essential to beat the crowd. 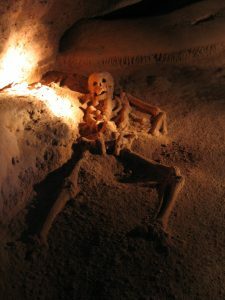 It’s hard to describe the feeling you have when you swim into the caves and you are face to face with the actual skeletal remains of a people who lived hundreds of years ago. As you venture deeper into the darkness you start to imagine the types of rituals and activities that happened here by fire-light. We were lucky enough to have the owner of Maya Walk (Aaron Juan) be our guide into the caves. His extensive knowledge and passion played a really important part in enjoying the history that happened in these caverns. The science nerd in me got really excited when he went above and beyond and demonstrated abiotic fluorescence in the cave walls by using his purple laser pointer to make the rocks glow! 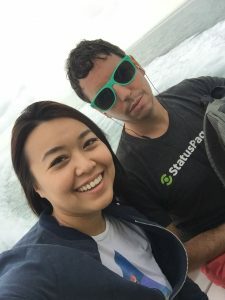 I met a really great French couple (Chloé & Jonathan) who also decided to travel around the world for a year. Their strategy is to work on farms as they make their way around the globe. WWOOFing as it’s called (Working Weekends On Organic Farms) pairs farmers with willing volunteers. You get free room and board while you work on the farm. They have been blogging their experience (In French) at behindthelandscape.com. They have some amazing shots on their Instagram: tdmbio. 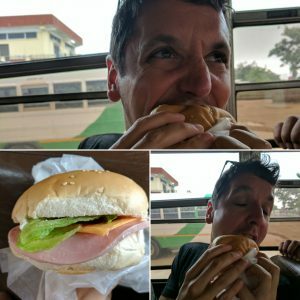 My breakfast on the chicken bus ($2BZD). So dirty, yet so good. You can see the enjoyment in my eyes. We got up early the next day to catch the chicken bus to Belize City. 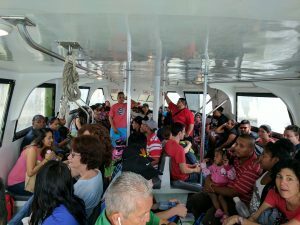 Our destination was San Pedro, Belize, the most southern city on the island of Ambergris Caye. Caye, can be pronounced both ways: “kee” or “kay” and is not to be confused with quay. It is a sandy island on the surface of a coral reef. Another example would be the Florida Keys (yes! another acceptable alternative spelling) or Rama Cay (yup, the third way you can spell it) in Nicaragua. Whereas a quay (also pronounced like “key”) is a wharf where ships dock to load and unload cargo or passengers. Anyway, we pay for our round trip tickets ($70BZD) on the San Pedro Belize Express and pile into the boat. I decided to stick to the rear, where it was open to the outside air. The rest were packed in like sardines. How is it down there?! I grab my headphones, press play, and hunker down for the relatively smooth 90 min ride. Vivien and I on our way to San Pedro.